Our brain contains 80-90 billion neurons (and many other cells), and — despite over 100 years of brain research — we still don’t know how many different kinds of neurons exist in a single brain. Not unlike humans, distinct subtypes of neurons are born looking different from each other, and grow and change over the lifespan — changing their physical form with their level of activity. Technology has now enabled us to image individual 3-dimensional neurons inside living brain tissue. But to trace them and classify them quantifiably requires the assistance of the best 3-D digital analysis tool in the world — the human visual system. This is where you come in. Mozak brings together groups of uniquely-talented people to solve this enormous problem together. By learning how to trace neurons from different brain regions and different organisms, we can begin to quantify and classify their distinct differences, and — at the same time — learn more about what it is that makes us uniquely ourselves. The key to Mozak is to allow humans to do what they are good at, and computers to do what they are good at. In this case, humans exceedingly outperform computers with their ability to resolve and trace objects in 3 dimensions. Although computers can complete the reconstruction of robustly traced neurons, many neurons have delicate and highly branched structures that your eyes will distinguish far better. Your ability to do this will help us to build systems that work better at doing this, and can lead to focused discoveries in this space. Like other science games, computers can quickly simulate, verify, and potentially perform local optimizations on player designs — something that would be tedious and inefficient for humans to perform. By discovering new 3-dimensional neuronal arborization patterns, eventually matching them to firing and genetic patterns, and then simulating them in the game, we hope that you will come up with new ideas that can be applied to ongoing research in the field. A neuron is a cell that is basic unit of the nervous system, and they are specialized to interconnect and transmit information throughout the body. Like all cells, each neuron has a cell body at its core that contains its DNA, but they also have something other cells don’t — highly complex extensions called dendrites and axons that transport electrical and chemical messages in and out of the cell, enabling neurons to communicate with one another with incredible speed and precision. The intricate branching patterns (called ‘arbors’) of these extensions are what give neurons their wonderfully strange and diverse shapes. Where an axon contacts the next cell a specialized structure develops which is known as a synapse. Each neuron can have entirely different arborization patterns that indicate their function, and many thousands of individual synapses. In order to understand exactly how a neuron works, it is important to understand the architecture of each neuron, but computer algorithms still fall short of humans in their capacity to successfully reconstruct complex neuronal arbors in 3 dimensions. 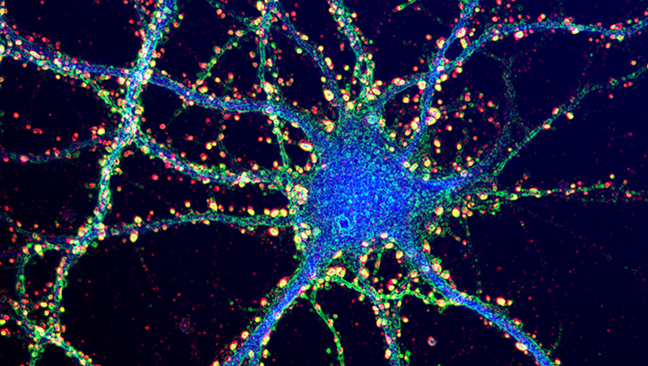 Why is it important to tell the structure differences between neurons? Neurons are programmed to have a particular form that can grow in a more elaborate way as they become stimulated and interconnect more highly with other neurons. If this does not happen, then a child could develop a learning disorder (like autism) in the circuit that is most affected. Similarly, if a problem develops in a circuit in adulthood it could manifest in a neuropsychiatric or neurodegenerative disorder that we might be able to diagnose better If we understand how it changes brain structure. With sufficient understanding of how ‘normal’ neurons should appear in different circuits, we will be better able to understand the problems that develop in different brain diseases — and know what we are trying to restore when we attempt a cure. The past few decades have seen incredible advances in technology that now allow us to see the 3-dimensional structure of neurons as they fire and grow and adapt inside the brains of multiple organisms. This allows us to develop a deeper understanding of how each neuron might operate in a local or distant circuit to develop its custom physical signature. Once we have collected enough distinct neuronal signatures we will also ask for help in identifying patterns they fit into — in order to classify them. By mapping this information back into a 3-D brain, we should next be able to better predict the structure and activity of the circuits they participate in. During the last 3 years, the US-led BRAIN initiative and several large-scale international projects have stimulated the collection of many petabytes of images of individual neurons. The Allen Institute for Brain Science (a private partner of the BRAIN initiative) has teamed up with the Center for Game Science at the University of Washington to build Mozak to speed up and expand this effort. BrainFacts.org is a neuroscientist-sourced website providing fundamental information on how the brain functions, with additional information for general use on the neuroscience behind the causes, symptoms, and outcomes of brain disorders. These TED Talks contain twelve informative talks on understanding the brain. Neuroscience For Kids is a University of Washington staff-created website created for all students and teachers who would like to learn about the nervous system.